The above verse was often used by a fundamentalist Christian faction known as the Plymouth Brethren to argue against the hierarchical structures of most other Christian denominations. They didn’t have priests, bishops, cardinals or even ‘pastors’. The minimised the use of symbols, imagery and ceremony. Their Sunday meetings involved sitting silently in a room until a congregation member decided to say, pray, read or sing something. This was all with the loftiest egalitarian aims, rooted in revulsion against the ecclesial aristocracy of the 19th century Church of England in particular (but obviously other denominations as well). 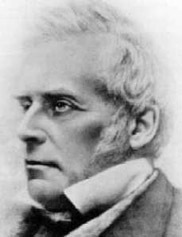 While arguing that everyone should interpret scripture themselves rather than listening to ‘teachers’ or ‘leaders’, John Nelson Darby‘s writings themselves became ‘scriptures’ (and he a revered figure) even outside of the Brethren. The meetings (not ‘communion services/eucharists’) were not as egalitarian as they may appear–only adult males who were members of the group (not ‘church’) were allowed to say anything. Women were silent had kept their heads covered. Outside of these Sunday morning meetings, people (men) did give talks (not ‘sermons’). Women taught Sunday School and other women. A great quantity of unwritten laws arose through practice (such as how to carry Bibles and hymnals, what types of prayers to offer when in the course of a meeting, women could not wear trousers to meeting–even in the mini-skirt era, etc.). No teacher. The Brethren eschewed ‘priests’ (and the Roman Catholic ‘Father’), but had ‘Travelling Brothers’ who were funded by the Brethren to spend their lives speaking at different meetings, writing articles and books, etc… It doesn’t seem a million miles away from the ‘sage on the stage’ rebranding into ‘guide on the side’ (or ‘meddler in the middle’?!). I’m going to be rather traditionalist here and suggest that, while I think this is pertinent to how students learn (by doing rather than being talked at, for example), the who they are learning from is still important. They are a guide; they are there (ideally!) because they‘ve walked a road similar to this before. They’re not afraid of learning something new from the students, but in this context they do have a certain role. No method. I don’t know much about psychology, but I think it’s safe to say that people like a degree of routine–especially in social situations. They generally feel more comfortable with norms of behaviour, whether their personal rituals or those of a group or society. Thus the many unwritten rules that arose to fill in the gaps in the early days of the Brethren (who had plenty of written rules to go on already) were never overthrown but became part of the culture. Likewise, I think educators sometimes take the rules away in order to give students more freedom, only to find that the students are constantly asking for boundaries to be set, or have misinterpreted a task in an unforeseeable way, or become frustrated by having to ‘guess’ at what they’re supposed to be doing. Not that this isn’t a very difficult balance to achieve–it takes experience and an understanding of a group of students. I guess the important part of this is that ‘open’ does not equal ‘unstructured’. No guru. Another danger of letting students experiment, experience or interpret is that they will do so in a vacuum. In addition to an expert of some kind and a structure, students need to know the broader context–they need the object to be re-solidified. The Brethren, while claiming to rely on the bible alone, actually based their beliefs on other people’s interpretations of it; the most dangerous thing about this was that it was almost always unconscious: people actually thought that such-and-such a doctrine had come from their objective reading of scripture (not from Darby or Brother Smith or from what so-and-so said last week at meeting). The context existed, but was not recognised. I’d like to argue that this can happen in education as well (it was certainly apparent when I was studying literature as an undergrad): students can only form understanding based on the resources available to them–I could read TS Eliot with understanding, but how would this compare to my understanding after some historical background, reading contemporary and modern criticism, reading other poetry of the same era, discussing Eliot with people with different points of view and understandings… These resources existed, but it was seldom explicitly suggested that I go looking for them, that they would broaden my understanding, etc. This is still all getting away from abstraction, categorisation and the subjective human (which is why I’m blogging about it now!) and I think shows in a different way how the teacher, while their role might have changed in the evolution of educational theory, still has an important (and certainly more nuanced, changeable and demanding) part to play in the student-inquiry-object-rhizome morphology. Looking at this from a broader perspective, though, we may (like Edwards?) then ask what education is for anyway. But…that’s for another module. Thanks to Van Morrison for the title. Another collection of thoughts on the readings…hopefully toward informing my assignment! As I was reading Edwards and Pedersen, and trying to connect them to the week 9 readings as well, I got in a bit of a muddle. Edwards seems to want to envision a ‘thing’ without a subject. I could think of three possible interpretations: 1) I could be a Montessori student and pursue an interest and let it lead in all different rhizomic directions involving other people, objects, ideas, information, etc. ; but then I would still be the centre–I’m pursuing what I find (subjectively) interesting to me and following those tracks. 2) We could have a group of interested people pursuing something, but then the group (or perhaps its convener) would be the central subject, following their collective and/or diversified interests. 3) We could look at these two scenarios another way, and suggest that the individual or group could be de-centred in favour of the interest/topic–this is the central ‘thing’, because it’s not really a thing, but an amalgam of the people, information, locations, objects, times, ideas that go into its thing-ness. But how does this change what we do? This is where I got stuck because it seemed to me that, if you try to bring down subjectivity (which Edwards does grammatically as well as philosophically throughout his article), you’re bringing down agency as well. To me it seemed that, to not act as a subject, I couldn’t be consciously pursuing anything. I can’t escape my own subjectivity. Clearly this isn’t Edwards’ goal. What I assume he (and Pedersen as well) mean is that we need to revolutionise our perception of our subjectivity by acknowledging both total inter-relatedness and the false dichotomy between meaning and matter. So, while my concern about individual/group agency, as far as interest-pursuit, was put to rest, I was still not clear on what this would look like on the ground for learning. I could imagine Edwards abolishing all universities and putting public funds towards everyone making their interest-pursuit experiments public. Or I could imagine him making employers give their workers weekly times to learn something new related to their jobs. Somehow, though, I couldn’t shoehorn his ideas into a more traditional classroom. Even Angus et al, while a good example of teaching students how to perceive the world in this way, were still instructors of a certain course at a university. If their subject was American literature 1700-1850…or nuclear physics…they might have struggled more to follow the rhizomes and cover the topic as their department expected and relinquish the authority of the instructor…all of which they had to contend with as it was. The context itself dictates that one person(s) tells other people what kinds of things they need to engage with. This brings me back to the question of agency. But the problem now is: how do we justify pursuing one interest over another? I would argue that it isn’t problematic that Angus et al decided that students who had chosen to take their course (or chosen a path of study for which is was compulsory) should engage with this topic. They had the experience to tell them that this was a beneficial thing to do; the students might not have been equipped to make such a decision themselves, or could have followed unproductive or skewed pathways; they might have wasted a lot of time looking for resources that the instructors knew of or might have gotten hold of something incorrect and continued on with misinformation…most importantly, though, is that we don’t know what we don’t know. That, to me, is what experts are for. On the other hand, I don’t think this necessarily goes against the arguments we’ve encountered over the last couple weeks. In fact, I think this kind of group situation, where there are acknowledged experts who structure but do not lead, and where the non-experts are responsible to themselves and each other, has the potential to reduce subject-centrality both in an individual’s worldview and in their ‘experiments’. The problem with the interest-pursuit model remains that, as much as one person can attempt to let a topic guide them and de-centre themselves, they are always going to be a subjective self. A group, on the other hand, and especially one with members who have both ‘done it before’ and realised the uniqueness and value of every subsequent ‘doing it again’, is more likely to keep taking its focus away from the self and putting it on the common area of inquiry. 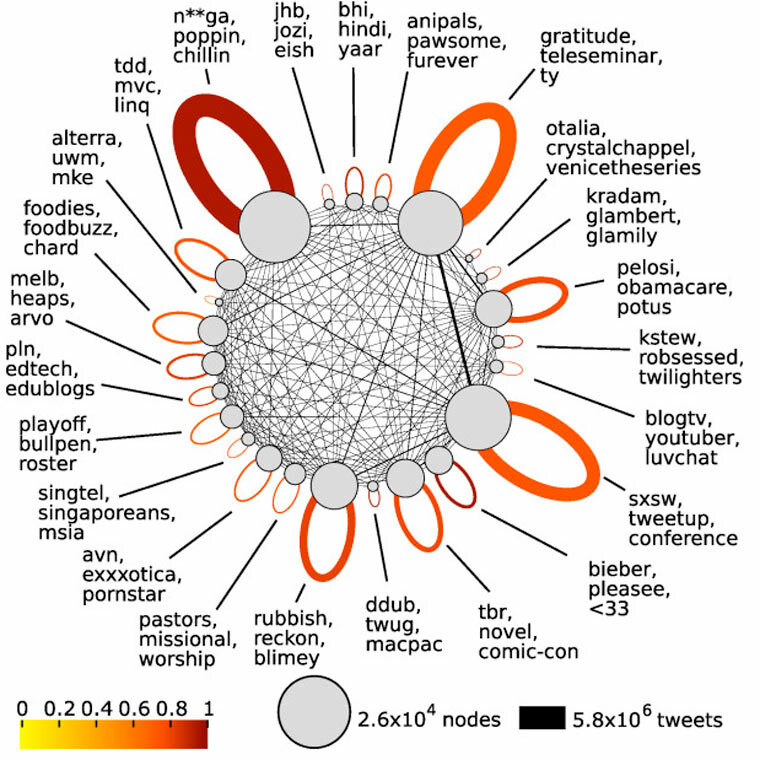 Don’t know how convinced I am by this…they include terribly idiosyncratic terms like ‘rubbish’ and ‘Bieber’ ; ) But there are some interesting tidbits, not least the assumption that these tweeters are communities, and also some really emergent cultural grammars as well. On another tangent, this is linked to the Ship of Fools site, which perhaps suggests the pastoral idea of the church as community more than a pixeled nave…although perhaps loses something in the architecture of a discussion board? For the first few pages I felt like I was reading James Joyce (and much amused by a later reference to the same). I’m not sure if the style changed or I just got used to it, but I think it also had something to do with my pretty much complete lack of knowledge about feminist theory/history/tropes. I didn’t feel like I was a member of the community Haraway was addressing (online or off!). Maybe this is why one of the points under ‘State’ struck me: ‘invisibility of different social groups to each other’ (p.50). I felt that the ‘book audience’ was a social group that was invisible to me; not that I would not be interested in the same things they were, or that I might disagree with them politically or socially, but that I didn’t have the assets that I would have needed to be a member. And I think this is closely related to Haraway’s problematisation of ‘unity’. As identity is neither one-dimensional nor static, uniting a group based on a single, unchanging identifier is (at least) unsatisfactory. Her mention of affinity groups (p.38), then, struck a chord as far as our conversations over the last couple weeks about what defines community and whether and how much identity is involved… Obviously I didn’t have the right ‘affinities’. But Haraway seems to struggle with this a bit, which is perhaps why I noticed it more. For example, from my uninitiated perspective, I felt that ‘developing feminist science/technology politics in alliance with anti-military science facility conversion action groups’ or the ‘welding’ of ‘personal preferences and cultural tendencies’ onto politics (for middle-class professionals) (p. 49) was unification on the assumption that ‘if you have affinity A, then you’ll probably have affinities B and C’). This didn’t seem to fit in with the heterogeneous cyborg at all. There’s a high likelihood that I’m missing the point, but I’m concerned that it might be more difficult to sustain messy plurality than Haraway sometimes intimates. Haraway certainly doesn’t try to hide her potential subjectivism, but it is interesting to see it creep in unexpectedly, as when she generalises from specifically American issues. I found the insistence on questioning the existence of an objective ‘organic or natural standpoint’ (p.39) especially applicable to conversations around online/offline duality. I was wondering if this relates to survival. Several times Haraway makes it clear that the aim of the cyborg is survival (p. 49, 53, 54) but I’m not sure if this is meant to be the aim so much as the explanation of a process of natural selection by which the people who are the best at being cyborgs are more likely to survive…? Or if it’s meant to be conscious survival, it does seem to suggest a curious Machiavellianism. Or is it the survival of an evolving kind of cyborg feminism? Or something else? I’ve been struck by a few things this week in finalising my ethnography and [reading? viewing? interacting with?] other people’s. This led to another interesting trope–that social connections can be ‘mediated’ by shared interests. Chantelle showed this well, for example: Person A (with interest in X) <--> Blog B about X <--> Person C (with interest in X). Even if neither comment, I think the idea that the blog has a large readership in itself affects how A and C will feel about reading a blog about something they have a personal stake in. This is stretching it a bit, but likewise if A commented, I think it would be the degree of C’s interest in X (and thus how often she looked at the blog, read the comments, etc.) rather than her desire to comment herself that would give her the sense of belonging. Here is my mini ethnography on the twitter feed for the Durham Blackboard Users Conference 2013. I decided to use Storify as I was intrigued by the approbation of narrative style in ethnographies both in Hine (2000, p. 44) and in a chance email quoting Carolyn Ellis (The Ethnographic I, 2004) regarding autoethnography. Not to mention that it seemed to handle tweets well within a ‘story’ context! 1) What ethical expectations are established by the venue? Twitter is considered to be a very public forum. I have first determined that each tweet I quote was available without logging into twitter (e.g. via twubs or a search engine) before posting it. 2) Who are the subjects posters / authors / creators of the material and/or inter/actions under study? All contributors were adults attending a professional event. 3) What are the initial ethical expectations/assumptions of the authors/subjects being studied? Participants were not told that the twitter feed was private, nor were they cajoled into using it. Participants could set their own twitter preferences, or refrain from tweeting all together. Participants may not have been aware that the tweets at this hashtag were being aggregated on another site (twubs); this aggregation had been applied to the hashtag by a third party for at least two years before the event in question. However, for the purposes of this ethnography I only used tweets which appeared both in this public space and publicly on twitter. 4) What ethically significant risks does the research entail for the subject(s)? The possible harm here is minimal. It is possible that a participant who did not understand how twitter works could have posted tweets that they did not wish to be public. However, this study does not significantly add to this risk, as the tweets were already public. I’ve been thinking a lot about transience, as this has arisen as an unexpected theme in my ethnography. Does a community have to be sustained to be a community? For how long? And conference attendees can be a community. Which leads to my main issue with transience this week, namely the disappearance of tweets from a hashtag search. This led me to think about other instances of online community artefact transience, and what this means to the community members. I will explore this as far as twitter is concerned in my ethnography, but it’s important to note that it isn’t unique to twitter. Finally, I’ve been thinking about ways to produce my ethnography, and am quite taken with the idea of ethnography as subjective narrative (particularly as I was a participant, and unaware that I was going to be scrutinising the community later!). Here’s an anthropologist who seems to want to relegate post-modernism to ‘comparative literature, gender studies, philosophy and others’. But don’t worry–proper science will eventually reclaim the field! This is an interesting tracking of an online meme and rather funny for BBC News to be musing over what makes something cool. The article certainly considers this to be a global and cultural phenomenon, and highlights the importance of making your own video (rather than, as in Gangnam style, mainly consuming the video or its spin-offs)…does that mean there is a Harlem Shake community? It was apparent that this couldn’t have been possible without corporate backing, however obliquely. YouTube is pretty ubiquitous, but it was a combination of the original song’s producer and collegehumor.com that actually got the meme started. And the article argues that mainstream media attention tends to feed rather than kill ‘grassroots’ fads.